It's not so much my "softer side" writing this as my, "nerdy, inner child." There are a handful of fantasy movies that I hold near and dear to my heart; movies that I could watch, marathon style, on an unending loop. Movies that I think of as "companion pieces" that boast similar sensibilities, senses of humor, and charms. These movies are among my favorites and if there's one in this bunch you haven't seen - I urge you to do so! I'm always on the lookout for other movies that can fit into this group... And I may actually be adding Mirror Mirror to the bunch. 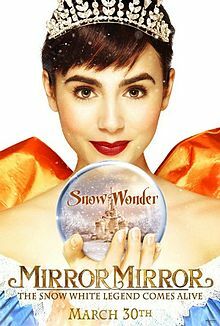 If Snow White and the Huntsman was created for Twilight fans, Mirror Mirror was created for Buffy fans; that cheeky, post-modern, self-referential, slightly snarky nerd humor that powers nearly everything my generation is into completely permeates Mirror Mirror. Snow White and the Huntsman tried to be an "action" movie while Mirror Mirror is comedy gold. If you'd asked me, prior to watching it, if I imagined Julia Roberts as "funny," I would have said, "not on your life." But lo and behold, she's kind of hilarious. I'm loathe to admit how charmed I was by this movie after writing the following: fans of Joss Whedon will literally just cream themselves over this movie. It has all the trappings of his work: the snappy banter ("There's I'm in the same room as a prince crazy, and then there's good old fashioned plain traditional psycho crazy.... I fear she's the latter. "), the faux empowered female lead ("...I read so many stories where the prince saves the princess in the end. I think it's time we change that ending. "), the general reversal of social conventions (the queen isn't "evil" she's "insecure.")... it goes on and on. But the true high point of the movie were the dwarves. Seriously. They were amazing. 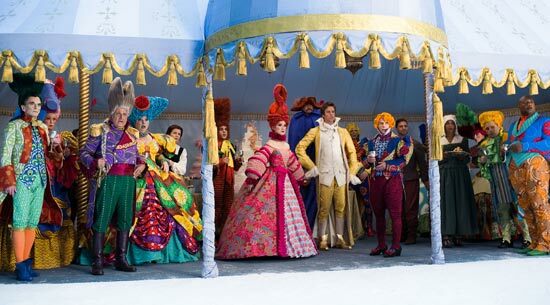 And the costuming choices made for them were simply superb. So, imagine everything that Ever After wanted to be (but couldn't quite pull off). Got it? Mirror Mirror nailed all those things. And if that's not enough to win you over (what, is your heart made of stone?) than the visuals should seal the deal. If you've ever watched any of Tarsem Singh's movies you know that they are opulent feasts for your eyeballs. You may not have known that your brain was starving for vibrant, surreal imagery BUT it was and Tarsem Singh's movies are exactly the meal needed. In case you need a refresher, he's the man responsible for The Cell, The Fall, & The Immortals. Everything that Tim Burton wanted to pull off with his remake of Alice in Wonderland, but didn't quite manage? You guessed it. Mirror Mirror nailed. My only visual complaint? They really should have done something with Lily Collins' eyebrows; How in the name of the style gods am I supposed to believe she's the fairest in the land with those caterpillars on her face?! Why are eyebrows back in fashion? They're terrible, horrible, ugly things that must be beaten into submission, punished with wax and tweezers, and ultimately destroyed (if possible.) Please stop allowing celebrities and fashion icons grow them into shag carpets. ... Whew! Sorry. Got lost in my rant-centric head there for a minute. 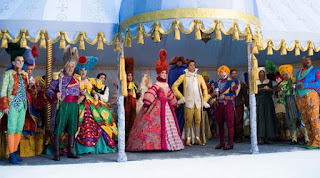 You probably don't think that you want to watch Mirror Mirror but, you should give it a chance.